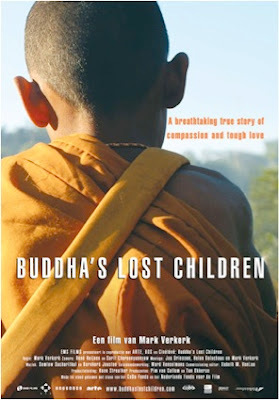 More than a year ago I was working on the score for a film called Buddha's Lost Children. It came out recently and won all sorts of awards. I had this idea that the entire score would be founded on a single 17 note motif, so that the entire movie would seem to be a long meditation, revolving around a single still center. I didn't compose all of the score; basically one very long meditation music which was played by members of the Siam Philharmonic, a few shorter segments, and some musical sketches of the rest of the score. Somehow, during post, I had a few "creative differences" with the director which might well have been ironed out with time, but there wasn't any. So a couple of other composers are credited beneath my credit. Still, I don't mind; they've done an excellent job matching my style and they haven't deviated from my themes. So, all in all, a gorgeous flick and very moving; I've met many of the kids that it's about, troubled youths who were taken in by this wild boxing champion monk in the mountains of northern Thailand. Is this movie one of my lost children? Hardly … I'm proud of the work everyone did on it. Many creative artists are married to their work, and I've had no biological children so far, though I've rather successfully brought up two kids, Johnny who became legally mine and Trisdee who is the true child of my intellect. They are mine in every sense (but the biological one). But twenty years ago, I had a foster kid who lived with me for a few months. I haven't thought about him in a very long time; he went up north. (Northern California that is, not Laos!). As this is a public blog I'll just call him J. I dreamed about him and I guess this blog is turning into a dream diary as well as a sonnet posting place. So here goes: there's a huge mansion with many rooms that often figures in my dreams, it holds vast ancient treasures, sculptures, golden artifacts. I'm wandering in the mansion and in one corner I come across a stack of holy books. They're all in Greek, all matching green volumes like the Loeb classical library editions. Each one is a book from the Bible, but the stack is much higher than it should be because there aren't that many Greek books in the Bible and Hebrew is not mentioned. There must be other gospels, secret gnostic texts, I don't know. I look up and there's a sort of pavement outside, and two guys are talking and sipping coffee under an umbrella, like in a French streetside café. But we're separated from the main street by a chainlink fence that stretches as far as I can see in both directions. So, suddenly, there's J. on a bike, riding alongside the chainlink fence, outside the mansion. And he takes a left turn and circles back so he seems to be riding in a great circle with our chainlink fence as part of its perimeter. He's riding in a fury, I don't know why, in a heightened emotional state. Then, I lift up this grating on the floor of the room I'm in (looking out at the sort of sidewalk cafe) and find myself descending into a basement. It's green, plush velvet, sort of American colonial in style. There are some children playing but I ignore them. I head into an inner room where J. is lying on a bed or couch and he's very sad; I know twenty years have gone by but he is always, forever, a ten-year-old kid with blonde hair, bangs, and an upturned nose. I don't know what to say so I just comfort him as best I can.